Soak the beans in cold water overnight. Drain, cover the beans with water and cook until tender. Drain again and set aside. In a large bowl, combine all the ingredients for the dough and knead until a stiff dough forms. Divide the dough into two equal pieces and roll each piece between your palms into a ball. Cover the dough balls with a kitchen towel and allow to rest for 5 minutes. In another bowl, mix all the filling ingredients together and set aside. Take one dough ball and roll it out on a floured surface to a thickness of 2 mm. Spread some flour evenly over the rolled out dough. Fold the dough sheet in half, then fold it back and forth onto itself two or three times and cut the sheet crosswise to form rectangles. Unfold the rectangles, lay them on top of each other and cut the stack crosswise into squares. 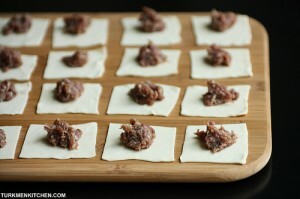 Place about a teaspoon of filling in the center of each square. Fold the dough in half and pinch the edges together to form a rectangular pocket. Bring the two corners of the folded edge together and pinch to seal. Arrange the dumplings on a lightly floured tray and keep them covered with a kitchen towel to prevent them from drying out while you work with the other dough ball. To boil the dumplings, bring a large pot of salted water to a boil over high heat. Drop in the dumplings and stir them 3-4 times with a wooden spoon. 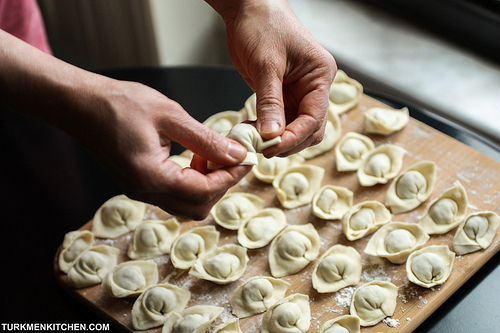 Cook for 12-15 minutes, then remove the dumplings with a handled strainer. 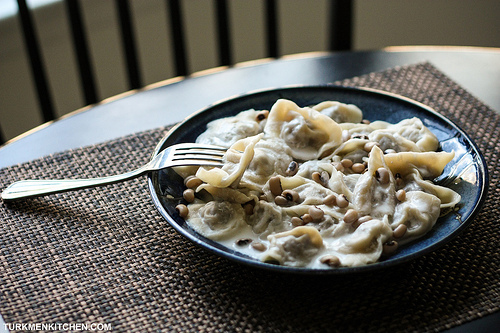 To serve, spread some yogurt over a plate, transfer the drained dumplings to the plate, add more yogurt, give the plate a shake to coat the dumplings, and throw in the beans.